Kerry Duffy thought she would never be able to make bread, but now she's selling her "slow and easy" bread at her Old Ottawa South bakery. "I am a pastry maker and I have always been light with my fingers," the Life of Pie owner told CBC Radio's All In A Day on Wednesday. "That's what I did with bread as well. I was always afraid of overworking it." The recipes she makes are simple, and she now hosts workshops to teach others how to make what she calls "the easiest bread in the world." "These breads that we're making are not traditional breads so you don't knead them. You work them very little, actually," she said. "[The] overnight fermentation, that's where all the magic happens." 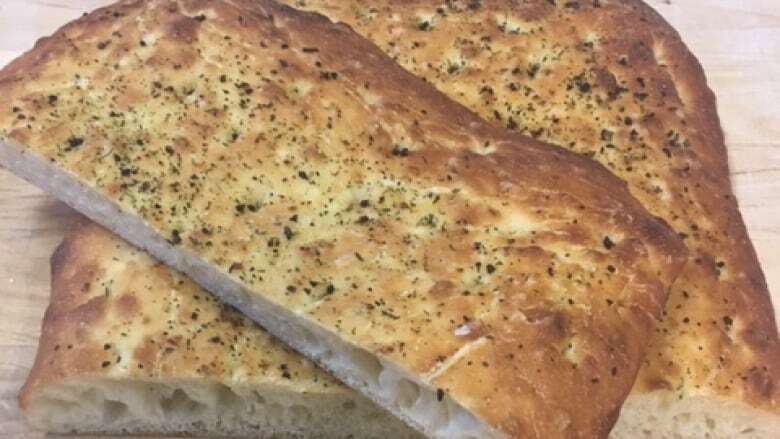 Below you'll find her recipe for focaccia bread. 850 g (6 3/4 cups) flour. 16 g (2 tsp) salt. In a bowl, mix everything together with a wooden spoon until all the flour is taken up. Mix for an additional one minute. It will be a very loose dough. Allow to rest in the bowl for 15 minutes. Prepare clean sheet pans by spraying, putting down parchment and generously oiling it. Place dough in tray and dimple out dough with oiled fingers. Rest 15 minutes (to relax gluten) and dimple out dough once more. Spray, cover with plastic wrap and refrigerate overnight. On the next day, dimple out to fill pan and spread herbed oil (or oil and salt) on top. Let rise for two to three hours. Bake at 425 F (400 F in a convection oven) for about 12 minutes, until golden and lovely.